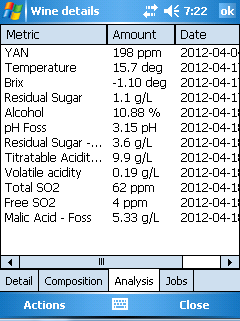 Checking barrel details with the barcode scanner is as simple as scanning the barcode on the barrel. Something like the following will appear. You can start a job from the job list by double-tapping it (more on working with jobs can be found here). 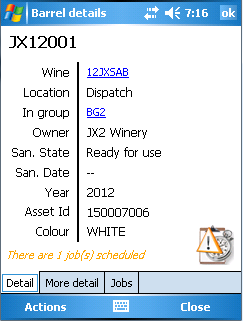 Again, jobs scheduled for this particular wine batch will show up in the list of jobs as well. 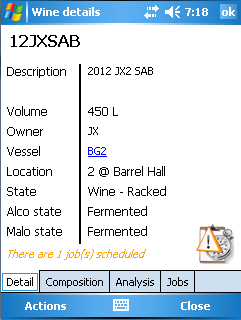 Under the Actions menu you can move the location of the barrels, as well as add a tasting note (which can be typed in from the device and saved). Double-tapping one of the barrels in the list will take you into the details as if it had been scanned. In the rare occasion where the laser for the scanner is not firing there is also a “Reset scan” button on the main menu. 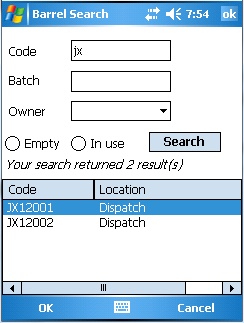 Tapping this reinitialises the scanning engine which should get things running again.